This THX-Certified Z906 5.1 system delivers 500 watts (RMS) of theater-quality sound. Digital and analog inputs, an easy-to-read-and-stack control console and a wireless remote let you take charge of your entertainment. Z906 works with computers, music players, TVs, blu-ray and DVD players, game consoles and other audio sources with digital optical, digital coaxial, RCA audio or 3.5 mm out, Nintendo Wii using the AV cable that comes with your console. Package contains speakers, speaker connection wire, 6-foot (1.82-m) six-channel direct cable, stackable control console, wireless remote, 3 AAA batteries, user documentation. This product logitech z906 speaker comes with 2 years. 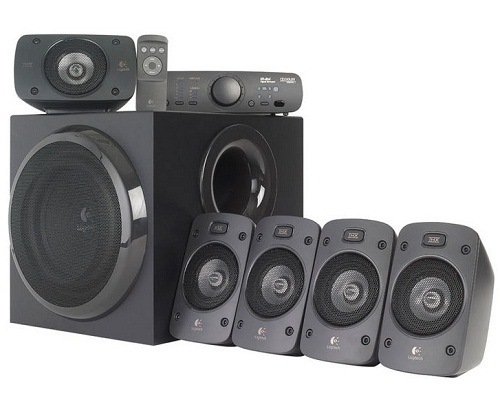 Visit showroom or call to buy the logitech z906 speaker from Dhaka, Bangladesh.